represent top educators and designers from all over the world. The six drum corps to take the field at the season opener of the Drum Corps International Tour, Saturday, June 16 in Akron, Ohio, will make history as the first to compete under a completely revamped adjudication system for the 2012 summer season. Spearheaded by DCI Artistic Director Michael J. Cesario, the inner workings of this new judging system—which has been under development for more than two years—have been put together by instructors who make up DCI's Rules and Systems Task Force (RSTF). This group is comprised of eight instructor members and two advisors, along with liaisons from the judging community. Passed by a unanimous vote of DCI's member corps, the system was further refined by the RSTF during the off-season with extensive feedback and involvement from corps instructors and designers during DCI's annual meeting and conference weekend this past February in Chicago. Cesario says the ultimate goal was to simplify and clarify the judging process, while also ensuring a certain level of "future proofing" as corps performances continue to change and evolve over time. "The intent was to create a system that would evaluate and reward whatever the corps brought to the field, no matter how innovative, today and tomorrow," Cesario said. The new system is divided into eight captions, each with a specific point allotment that adds up to a total of 100 points: General Effect: 40 points General Effect Visual: 20 General Effect Music: 20 Visual: 30 points Visual Analysis: 20 Visual Proficiency: 20 Color Guard: 20 Each 20-point sub-caption is divided by two Music: 30 points Music Analysis: 20 Music Brass: 20 Music Percussion: 20 Each 20-point sub-caption is divided by two "The Effect captions are weighted most heavily," Cesario says. "Within each caption, there are sub-captions which detail "What? "—that is the challenges given to the performer, as well as "How? "—the qualities the performers brought to the event." Each caption has its own individual sheet that guides adjudicators in determining what score to give a corps. Cesario offers these tips to help better understand the layout and content. Read back to front: "As we've introduced these new sheets, we've asked people to read the back of the sheet first, and then the front. The front is all about simplicity and clarity. The back of the sheet is a series of questions and information that outlines exactly what the judges are looking for and doing in their evaluations." Landscape design: "The sheets have been organized into a new horizontal format which gives the judges a visual reference as to the progress the corps are making as they move along the scoring scale." Note the parallels: "One of the things to notice on the sheets is that certain things pop up again and again. Looking at the General Effect Music and General Effect Visual sheets; while they're being used to judge different things, you'll find similar terms on both to keep consistency across all the captions. These sheets are meant to be transparent so that you can see everything that judges are being asked to do when evaluating a corps." 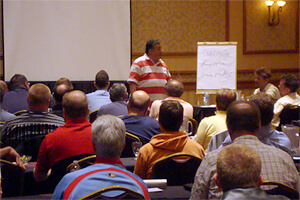 Cesario presents to the judges on June 1 in Denver. With the implementation of a new judging system, came the need to train all of DCI's adjudicators, whether they've been judging for a year, or for the last 40. Throughout the off-season judges have participated in educational webinars, and this past weekend (June 1-3), more than 90 individuals headed to Denver to take part in a mandatory training session. The three-day meeting marked the first time in more than five years that DCI's entire judging community has gathered in one place. "The spirit among the group to collaborate and hone their respective skills has never been higher," said DCI Executive Director Dan Acheson. "There was enthusiastic support from everyone in attendance." 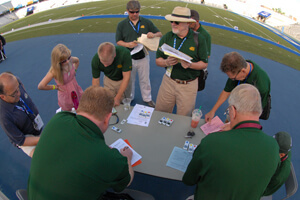 As part of the conference, judges participated in a variety of interactive educational sessions to further familiarize themselves with the ins and outs of the new system which will be employed at all 100 of the DCI Tour events scheduled for 2012. Since the system was extensively trialed during the summer of 2011, it gave the judges plenty of "real-world" examples to evaluate as part of their curriculum in Denver. As the final days pass before Drum Corps International's 40th anniversary summer season gets underway, DCI Judge Administrator John Phillips says that excitement is abound for 2012 and beyond. "While we have a 'new' system, the groups that march and play their instruments best will continue to be rewarded, Phillips said. "And from what we've already seen the corps present to us about their 2012 productions, we will continue to experience programs and performances this summer that are as accessible and engaging as ever before." View the complete 2012 Drum Corps International Tour schedule.